A while back we looked at the various types of locks that might be on offer to secure your items in self storage, and what the general consensus is on the best one to purchase. Our overall conclusion was that the disc lock was probably the best, being robust and due to its shape difficult to crack, making it a very effective deterrent. Lose the keys and both you and your lockpicker are in a difficult situation, as one of our correspondents pointed out. A good lock is essential as the last line of defence for keeping your items safely stored, and is bound to be a requirement under the insurance policy that you will have taken out either privately or through your storage company. An insurance policy should be able to steer you towards a general category of lock that will suit requirements, and don’t be surprised if you have to spend a bit extra to fulfill your part of the contract – an expensive and highly secure lock will cost more, but it will add a lot of value and peace of mind to your storage arrangements. Not only should locks be able to withstand attempts to crack them, they also need to be durable for the long term conditions they are in. Those who are storing items indoors might not have too much of an issue with this, but if you are using outdoor facilities, or even a garage or container, your lock is going to have to be fully weather resistant. Rust is obviously going to be a very big problem in that respect, so again you might have to do your research and get hold of a quality lock that can thrive in adverse weather conditions. 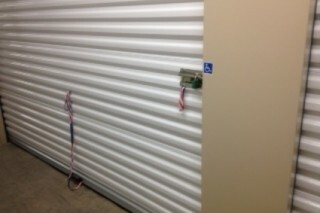 Much is said about getting a good lock for your storage unit, but little about the door itself. The door is just a barrier to entry as the lock is, so it is worth dedicating a few words to these. Most storage units are based on the sturdy metal shutter design, which means that, having failed to break the lock, there are no easily accessible ways of detaching the door other than completely breaking it, an act which would easily warrant attention. The door front will obviously have an attachment on which you fit your personal lock, and you must be confident that this is securely fitted so that breaking it off wouldn’t be possible, not even if the potential culprit had a bit of privacy and time on their hands. So just like storing your items safely, it is most important to ensure that you have a good lock in place and that the door to your unit itself is built to last.